New Delhi: The National Commission for Scheduled Tribes (NCST) was set up on 19th February, 2004 through Constitution (89th Amendment) Act. The Commission will be celebrating fifteen years on 19th February, 2019. The Commission in its 109th meeting held on 31st December, 2018 decided to celebrate the day in a befitting manner. Shri M. Vankaiah Naidu, Hon’ble Vice President of India has consented to deliver the first Foundation Day lecture of the NCST on 19th February, 2019 at 11.00 A.M. at National Media Centre, New Delhi. The theme of the Foundation Day lecture is “Constitution and Tribes”. The address is likely to dwell upon the making of the Constitution of India, various factors that led to creation of specific provisions for Scheduled Tribes in the country including scheduling of States under Fifth and Sixth Schedule of Constitution. It is also likely to focus on the review of the working of the constitutional safeguards during sixty nine years of the Republic of India. Central Coalfields Ltd., Ranchi: In recognition of their significant contribution in the field of sport promotion among Scheduled Tribe children in Jharkhand. Dr. Pronob Kumar Sircar, Tribal Welfare Officer in Andaman Adim Janjati Vikas Samiti (AAJVS): In recognition of his significant contribution towards Particularly Vulnerable Tribes Groups i.e. Oonges, Shompens, Andamanese and Jarwas in Andaman and Nicobar Islands. 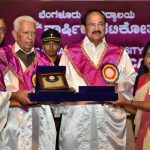 The award will be presented in the form of a citation, a medal along with an “Uttriya” by Hon’ble Vice President of India in the Foundation Day Function on 19th February, 2019. As the nationcommemorates “150 years of the Mahatma”, the National Commission for Scheduled Tribes is celebrating fifteen years of its constitution. On this occasion, the Commission has brought out a book titled “Janjatiya Swadhinta Sangram” in Hindi. The book, which is likely to be released by Hon’ble Vice President of India, brings out the little unknown facets of the freedom struggle of tribal people in the country. The book highlights the contribution of tribal uprising against british regime during freedom struggle. It includes articles on Shaheed Veer Buddhu Bhagat, Bhagwan Birsa Munda, Tilka Manjhi, Sidhu Kanhu, Bhumkal Gundadhur, Krantiveer Surendra Sai, Kunwar Raghunath Shah, Vidrohi Tantya Bheel, Amar Shaheed Veer Narayan Singh, Param Balidani Govind Guru and Janjati Veerangana Maharani Durgawati. It is an effort of the Commission to bring out the invaluable contribution and valour of tribal leadership in the freedom struggle of India. As it is tradition to have a cultural programme in any tribal function, the Foundation Day celebration will also showcase the rich tribal cultural heritage in the form of maweshi bhil dance from Gujarat and Rajasthan. At the same time, a visual exhibition on the Particular Vulnerable Tribal Groups of India will be presented by Anthropological Survey of India on the sidelines of Foundation Day Celebration at National Media Centre, New Delhi on 19th February, 2019.